My younger daughter and her family were here recently for a visit. 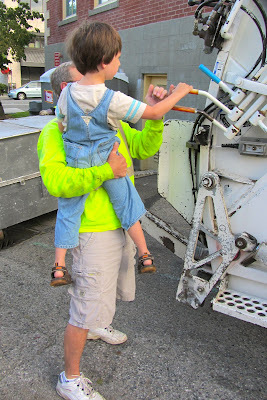 My grandson, who is a BIG fan of all things garbage truck-ish, heard some commotion in the alley early one morning as he, his sister and I were getting ready to go out for an early assault on a stack of pancakes. 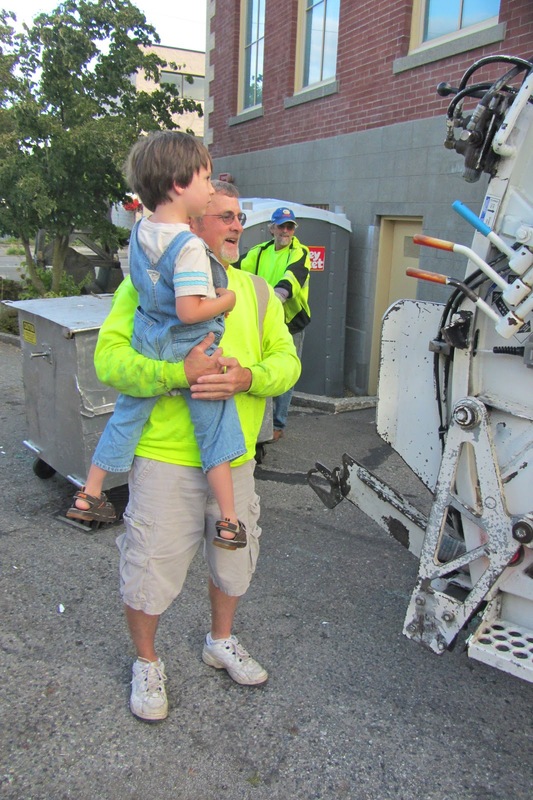 Well, when we emerged into the alley behind my house to discover that the garbage truck (a rear loader, I was told by the very informed grandson), was actually picking up the trash, well.....it was very exciting. It turns out that the gentleman who was operating the garbage truck, and all it's levers and controls, is a most pleasant man. He took a liking to my grandson (who was jumping up and down and shrieking, "Look, Gramma Gramma, it's the garbage collector! 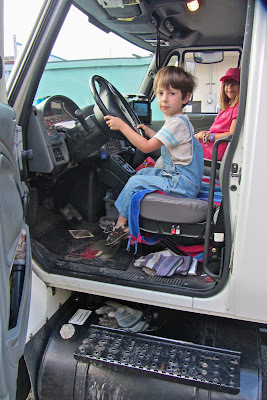 Look at beautiful his truck!"). 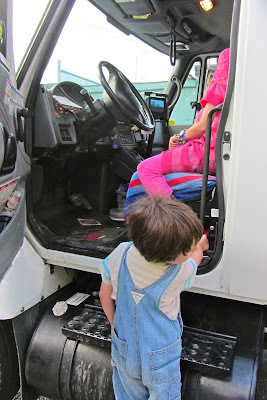 Then they were invited to climb up into the cab and sit behind the wheel of the truck! It was so cool. 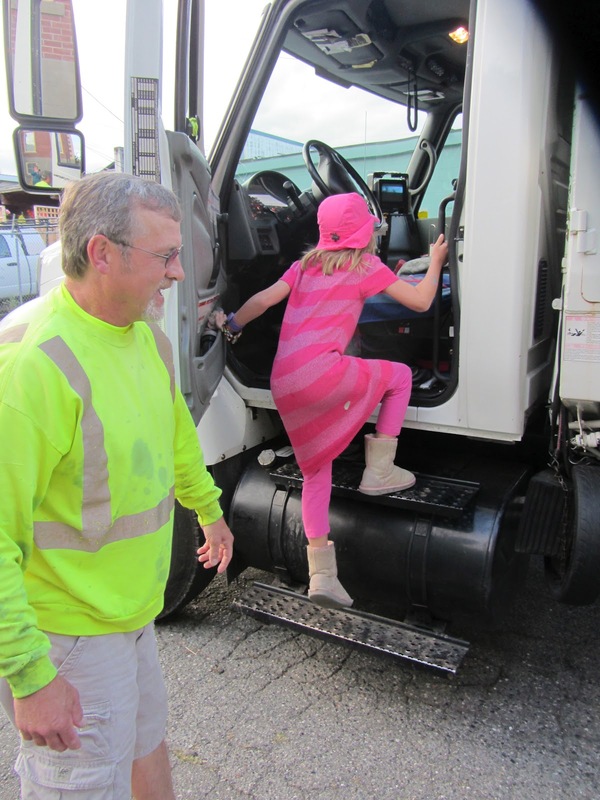 Can you imagine the delight for a 4-year-old garbage truck lover to be able to operate a real garbage truck and to sit in the cab??!? Let me tell you, judging by the the squealing and hand clapping, it was a most big deal. 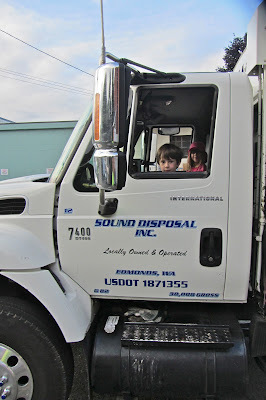 I would very much like to thank the extremely nice Mr. Nicholson from Sound Disposal in Edmonds for giving my grandchildren a real thrill. That man has a very big heart, bless him. What a fantastic experience for your grandson and his sister. How kind and understanding was the operator. I can just imagine the excitement. The pictures are great too. 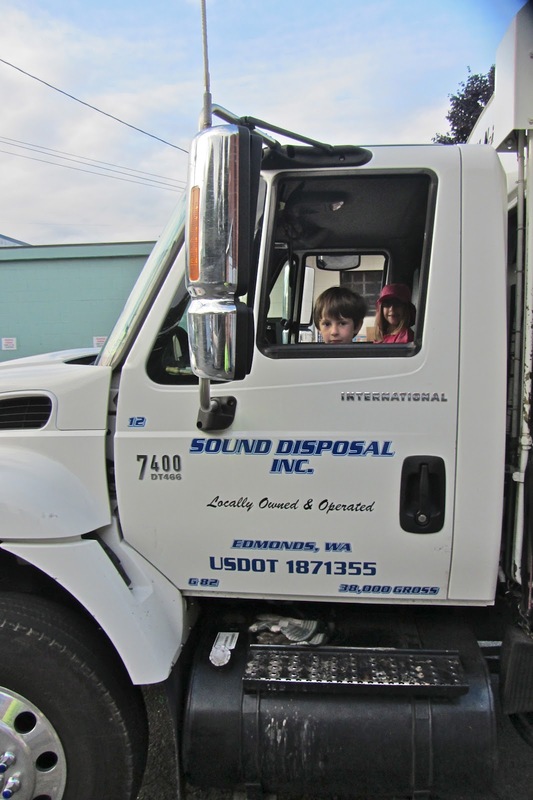 Our Fox is the same with garbage trucks and any emergency vehicle. One day a very nice policeman invited Fox inside the car and turn n the siren...well poor little Fox nearly died of fright and ever since he has kept well clear of any invites into the vehicle but he still likes to watch them and play with toy ones. How awesome! I am sure they had a blast. What an angel that man was for taking time out of his no doubt busy day to enjoy seeing things through a childs eye. That is absolutely priceless. Hugs.